You are given nine bottles of wine out of which one is poisoned. 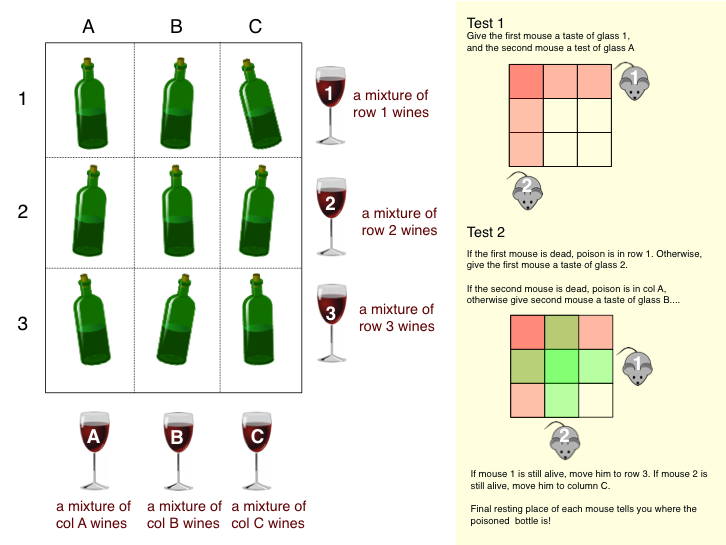 Given two mice (that will die when taken a sip of poisoned wine), how can you find out which bottle is the poisoned one by only performing two tests? Edit: I misunderstood the exact meaning of test. I thought that each “drink/sip” was a test. Thanks for all the answers. Number the bottles 0 through 8; these can be represented as $2$ digit ternary numbers (example, $7=21_3$). Call the mice Alice and Bob. For the first experiment, have Alice drink from every bottle whose first ternary digit is $0$, and have Bob drink from those whose second ternary digit is $0$. For the second experiment, replace every $0$ in the previous sentence with $1$. After the two experiments, the experiment during which Alice died (if any) tells you the first ternary digit of the poisoned bottle: if she died on the first experiment, it is $0$, on the second, it is $1$, if never, it is $2$. Similarly, Bob's lifespan tells you the second digit. Thus, afterwards you will know the bottle. ...and mouse 2 sip from 3, 4, and 5. If they both die, it was bottle 3. If mouse 1 dies, have mouse 2 sip from 1. If it dies, it's 1. If not, it's 2. If mouse 2 dies, have mouse 1 sip from 4. If it dies, it's 4. If not, it's 5. If neither die, you're left with 6, 7, 8, and 9. Have mouse 1 sip 6 and 7, and mouse 2 sip 7 and 8. If both die, it's 7. If mouse 1 dies, it's 6. If mouse 2 dies, it's 8. If neither die, it's 9. I posted a similar problem (and an explanation of the solution although not an outright formula) in an answer to a different question about puzzles. Everyone else here has the right answer, although they don't explain it as well. Each mouse has three possible states — dead in one day, dead in two days, not dead. This gives us that the information content of two trials is $3^n$ where $n$ is the number of mice — in this case, $n = 2$, so $3^n = 9$. But that brings us no closer to an algorithm that actually makes use of that information. So let's see what we'd need to do in order to be able to tell between bottles on the second day. On the first day, we do a binary trial in order to identify the wine as being in one of $2^n$ groups of bottles where $n$ is the number of mice. If both mice are eliminated, there is only one possible bottle. If one mouse is eliminated, there are two possible bottles. If neither mouse is eliminated, there are four possible bottles. Give bottle $1$ to both mice, $2, 3$ to the first mouse, and $4, 5$ to the second mouse. If both mice die on the first day, then the poisoned bottle was bottle $1$. If one mouse dies, then the poisoned bottle is one of the bottles given to that mouse. So test the remaining two bottles (either $2, 3$ or $4, 5$) with the other mouse by giving it a sip of one of them. If the mouse dies, it was that bottle; if it survives, it was the other one. If both mice survive, then do another binary trial with the four remaining bottles. Give $6, 7$ to the first mouse and $6, 8$ to the second mouse. If both mice die, then the poisoned bottle was $6$. If the first mouse dies, then the poisoned bottle was $7$. If the second mouse dies, then the poisoned bottle was $8$. If both mice survive, then the poisoned bottle was $9$. You can use this strategy for 243 bottles and five mice as well — on the first day, give one bottle to each of five mice, two bottles to each of the five distinct groups of four mice, four bottles to the ten distinct groups of 3 mice, etc. and leave 32 bottles alone. Number the bottles from $1$ to $9$ and the mice $A$ and $B$. $A$ drinks $1$, $2$ and $3$. If both die, poison was in $1$. If both die, poison is in $6$. If $A$ dies, poison is in $7$. If $B$ dies, poison is in $8$. If nobody dies, poison is in $9$. I liked Mike's answer, but I thought of a way to make it more visual, and also to show that each test really does involve a single sip for each mouse. Now, give the first mouse a drink from glass 1, and the second mouse a drink from glass A. Mice that survive advance to the next row/column for the next round, where first mouse get a drink from glass 2, and second mouse from glass B. Surviving mice advance again, and their final positions indicate the row and column where the poisoned wine is! Feed Alice a sip from 1, 2 and 3. Feed Bob a sip from 1, 4 and 5. If both die, it's bottle 1. If only Bob lives, give Bob a sip from 1, 2, 4, 5, 6, 7, 8, 9. If Bob dies, it's bottle 2, else 3. If only Alice lives, give Alice a sip from 1, 2, 3, 4, 6, 7, 8, 9. If Alice dies, it's bottle 4, else 5. If both live, give Alice a sip from 1, 2, 3, 4, 5, 6, 7 and Bob a sip from 1, 2, 3, 4, 5, 6, 8. If both die, it's bottle 6. If only Alice dies, it's bottle 7. If only Bob dies, it's bottle 8. If both lives, it's bottle 9.
if it was bottle 9, you know for sure 1, 2, 3, 4, 5, 6, 7 and 8 are safe. Even better, if it's bottle 3, 5, 7, 8 or 9 you can feed the remaining mice the remaining unknown bottle, to make 100% sure it contain poison while you get drunk on the first set of bottles.